Doesn’t it make you angry to spend thousands of hours practicing your instrument, thousands (or tens of thousands) of dollars to record and release your music…and then struggle to sell your album for $10? Worst of all, many of your so-called “fans” feel entitled to steal from you by downloading your music illegally. Stop trying to sell your music using the traditional (outdated) music business model. You must learn how the music business works today (vs. how it worked 20-30 years ago). It’s not hard… it’s quite simple and easy. Stated and unstated reasons why more of your fans don’t buy your music and bullet-proof solutions to overcome them. 4 powerful (and simple) strategies to get a lot more of your fans to buy your music. This works even if some fans already downloaded your albums illegally. A simple win-win tactic that helps you sell your music, attract more people to your gigs and add massive value to venue owners (without spending a dollar). How to convert a passive fan into a super loyal, raving fanatic who is eager to buy your music (and all other merchandise). How rewarding buying behavior grows your music career income by 44% without doing any extra work or taking on new risk. How to quickly determine who your most loyal fans are and use this knowledge to sell your music to them. How to use the scarcity principle to make your fans eager to buy your music. 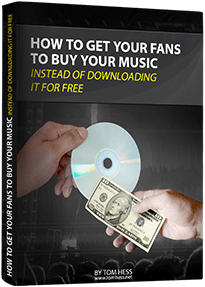 To learn (for free) how to get your fans to buy your music, enter your name and email, and click the 'Give Me Access Now' button. All information is kept 100% private and confidential.